A Yoga Moment: Why Do You Practice Yoga? Why do you practice yoga? Do you remember? Yoga has become more about the perfect pose, the perfect body, the hottest room, the hardest pose. 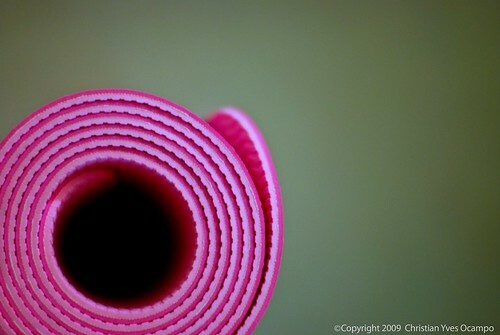 There is a great post from Patahbi Jois, "Yoga is an internal practice. The rest is just circus." Yoga is meant to change the path of your life, to bring more love and compassion to your relationships with others and yourself, to help you learn more about yourself and your place in this world. Remember that thought in case you get caught up in having the perfect pose, the perfect yoga body, or ever find you are comparing yourself to another. Is your practice helping you find more peace? To ask more questions? Does it bring out the best side of you (or help you dig up your dark side)? If not, maybe it isn't the right practice for you...There are many types of yoga, find the one that helps you find you. Check out this new video from my husband, Ron Erdman-Luntz, on feeling the chi flow through your yoga poses. This pose is Janu Sirsasana. Stay tuned, we will be releasing a new video every month. It's a new month so let's study a new pose! Check out my other blog, Musasana, to study one yoga pose a month. Yoga pose of the month: Let's study Virasana (Hero's Pose) this month. Take this month to spend time in this pose, teach it to your students, bring it into your practice, and bring on a deeper sense of reflection this season. Check out this post for the study points. Check out this video for ways to deepen this post. If you are a teacher, challenge yourself to teach this pose in each class this month. Add this component: Can you find something new to teach (and learn)? A Yoga Moment: What Comprises a Yoga Practice? Here is an answer to a Yoga Question from a reader. Enjoy! A Yoga Moment: How do I know my Yoga Practice is successful? How do I know my Yoga Practice is successful? creating an intention and having it come to fruition." A Yoga Moment: What Does a "Persevering Yoga Practice" Mean? In my favorite sutra, Sutra 1.12, of the Yoga Sutras, Patanjali refers to Abhyasa or Persevering Practice. Basically a Persevering Practice refers to dedicating yourself to your practice for a long period of time. Then, and only then, will you experience the Yogic state of bliss. The question is, what is a Persevering Practice? When we discussed this sutra in my monthly Sutra discussion group, I asked everyone if they felt they had a "Persevering Practice". All but one said something to the effect of, "Gee, I know I don't do enough..." Frankly, I was surprised that one person said, "I love my practice. It is exactly what I need right now." You know why I was surprised? In all my years of teaching (20+), I have never heard someone say they were satisfied with their practice. Everyone always assumes they are suppose to be doing more and wish they could. They aren't doing enough asana is usually the cry. They aren't doing it daily, or they don't have a long enough practice or they are not challenging themselves enough. There are actually four very distinct and powerful aspects to a yoga practice: Asana practice (the poses we are all so familiar with which strenthen our physical body), Breathing practice (or Pranayama, which pacifies the nervous system and clears the energy body), Meditation (which clears the mental body), and the study of the Yogic Precepts, philosophy (which moves us into our higher mind because it calls us to challenge our long-held beliefs.) I will write more about the four legs of a Home Practice in another post. For now, realize that having a "Persevering Practice" doesn't necessarily mean hitting your mat every day for 60 min of heart pounding asana. Spending a day with your attention on compassion is practicing yoga. Sitting to gently focus on your breath to calm your mind is practicing yoga. So, while I must admit, I, too, am one of the masses, I do wish I had a bigger yoga practice. I began yoga when I was single and living alone. I had nothing but time to practice, practice, practice. Now, with small children and a business to maintain, my time is more limited. At the same time, I can confidently say I have not gone one day of my 20+ year practice without practicing yoga. I bet you can, too! So, When is the Best Time to Practice? Is Your Practice Still Serving You? If you already have some type of spiritual practice, whether or not it is based in a religious tradition, is your current practice serving you? We all grow and evolve if we allow ourselves, and growth often means needing to change what we are doing. We may remain in a practice long after we have outgrown it, either from fear of leaving or merely out of habit. An outdated practice can actually keep us stuck in our current state of consciousness. It is a lot like being an athlete. If you never increase or change your workouts, you will always remain at the same fitness level. Make a list of what you consider to be your practice. When you do those things, are they fulfilling and leave you feeling connected, peaceful, contented? The purpose of a practice is to get you more connected to your Higher Self (i.e., your compassionate, joyful, true nature). Your practice may not do that for you anymore. I find I regularly need to tweak my practice and occasionally it needs an overhaul. With the practice of yoga, I can change my practice to balance my current life which helps me feel better. I do these tweaks on a daily basis. I needed to overhaul my practice when I changed my religious path from the one in which I was raised to one that matched my adult consciousness. Step Two: Identify Your Practice – Write down the details of your spiritual practice. What do you do? If you aren’t sure of what you do, begin to follow what was said in the chapter – what leaves you feeling fulfilled and more connected to your compassionate, joyful nature? If you still are not sure, it is time to begin a search. Do any books beckon you to read them? What type of practice do your friends and family have, especially those whom you respect? It may not be right for you, but it will be a good start. Yoga pose of the month for Musasana: Let's study Sukhasana I (Easy Cross-Legged Pose) this month. Take this month to spend time in this pose, teach it to your students, and bring it into your practice. Check out some ideas for you to consider. 1. Assuming you need at least 60 min. : One pose counts...really. 3. Trying to find the "perfect" time during the day for your practice: Know what the perfect time is? Whenever you will do it! 4. Skipping Savasana: It is the most important pose we can do. Do not skip it. 5. Assuming you need complete quiet, a candle burning, a meditational setting: I dare you to do your practice with the kids playing around you, the phone ringing, and the clutter sitting in the corner staring at you. 6. Doing the wrong practice for you: Your practice needs to balance you and your natural tendencies. If you tend toward being stressed out and doing all the time, you need a peaceful, calming practice. If you tend toward inertia, having a hard time getting going, you need a more energetic practice. 7. Forgetting the other legs to a Home Practice: A "Yoga Practice" includes meditation, breathing (pranayama), studying the precepts (such as compassion, truthfulness, etc.) as well as the asanas. My students frequently forget that spending a day focusing on being compassionate with their children IS practicing yoga! May your yoga practice blossom as you let go of the "shoulds" and expand your practice!